Good Morning, this is Capital Essence’s Market Outlook (the technical analysis of financial markets) for Monday November 5, 2018. 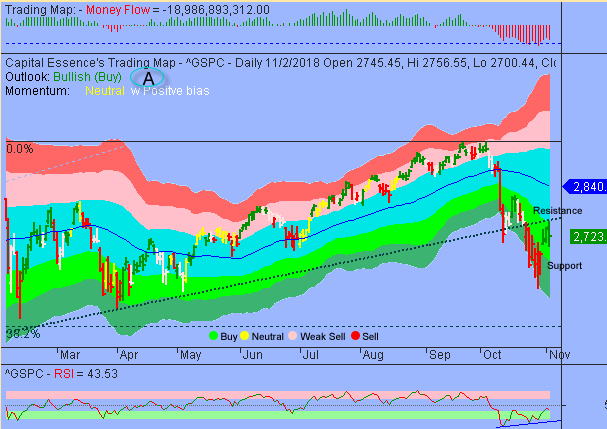 We’ve noted in the previous Market Outlook that: “Thursday’s upside follow-through had helped putting the bulls back onto the driver side of the market but it doesn’t mean that we’re out of the woods. Given the looming resistance near S&P’s 2750-2765, there is no big commitment to accumulate stocks aggressively at this point. With that said, until the overhead resistance is eclipsed, downside risk appears to heavily outweigh potential reward.” As anticipated, stocks moved sharply higher in early Friday session that saw the S&P traded as high as 2,756 before sellers stepped in and pushed prices lower. For the day, the bench mark gauge fell 0.7 percent to 2,723.06. The Dow Jones Industrial Average lost 0.4 percent to 25,270.83. The tech-heavy Nasdaq Composite dropped 1 percent to end the day at 7,356.99. The CBOE Volatility Index (VIX), widely considered the best gauge of fear in the market, rose nearly 1 percent to 19.51. Financials was among the best-performing groups last week. Contributed to the overall optimism was report that the Federal Reserve unveils a proposal that takes a tiered approach to match regulations for large banking organizations with their risk profiles. If enacted, the new rules could ease liquidity and compliance requirements for such banks as PNC FInancial (PNC), Charles Schwab (SCHW), U.S. Bancorp (USB), and Capital One (COF). The SPDR S&P Bank ETF (KBE) rose 0.32 percent on the day but is down more than 8 percent YTD, underperformed the S&P by a wide margin. Now the question is whether last week’s rally is a beginning of a new trend or it’s merely a dead cat bounce? Below is an update look at a trade in KBE. Our “U.S. 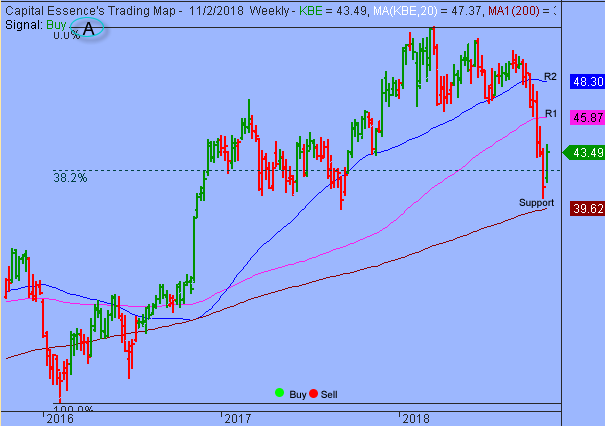 Market Trading Map” painted KBE bars in green (buy) – see area ‘A’ in the chart. The first dominant feature on the chart is the rising trend line starting in early 2016. The second dominant feature of the chart is the downward trend since September 2018, which represented the digestion period. The late October selloff broke several key technical supports, sending the ETF down to the 4-year moving average, a key technical level. Last week’s upside breakout above the 38.2% Fibonacci retracement of the 2016 upswing signify a bullish reversal and opened up for a test of the strong band of resistance between 46 and 48..
Short-term technical outlook remains bullish. Last changed October 31, 2018 from bearish (see area ‘A’ in the chart). Right now the most important thing to watch is the rallies and retreats behavior as the 2016 rising trend line, around 2760, is tested as resistance. There is a no reason to turn particularly bullish until this area is eclipsed. Short-term trading range: 2680 to 2765. S&P has support near 2680-2700. A close below that level has measured move to 2600 but for now it looks firm. The index has a strong band of resistance between 2750 and 2765. A close above that level could trigger acceleration toward 2820-2840. Long-term trading range: 2320 to 2813. S&P has support near 2645. A close below that level has measured move to 2320. The index has resistance near 2750. A close above that level has measured move to 2813. In summary, we wouldn’t look too much into last week’s trading action because it keeps the S&P within its short-term oversold consolidation phase. Momentum has weakened as S&P moved up to test resistance near the 2750-2765 zone. The longer the index stays below that level, the more vulnerable it is to lower prices. With that said, the bulls need to clear 2760 quickly or market will works off oversold conditions and fall under its own weight.